Home Magento 2 Automatic Related Products How to create Cross-sell Products block? In this circumstance. Jeanne made it successfully in suggesting catnip buyers move on to buy new cat food. It’s highly likely that customer will recommend another customer to purchase the same combo in your store. Cross-selling is no more a strange strategy to such noteworthy e-commerce platform like Magento, Amazon, Shopify, eBay, etc, that probably every time you enter a digital store, you will see a section of recommendation products at the bottom of the screen, which is based on your interest in a current item you’re viewing. As a result, they still stand a certain effectiveness that every store owner, newbies or veteran, can’t ignore obviously. In conclusion, Cross-selling is an expert way to boost your revenue without going through a rough time of searching new leads or consolidating new relationships with customers. This is a common trick when shop owners play it on the online selling pages. Consumers will be involved in some kinds of this discount: in the second they want to purchase an item alone, recommendation tool propounds some related products together with a lower price than the combo actual is. So buyers will feel like being bought a bargain instead of buying items individually. 1. Install Automatic Related Products extension. After being amazed by enormous this block can bring up to you, why don’t try to learn to have one in your store right today? Cross-sell block can be easily obtained by Auto Related Product extension introduced by Mageplaza. There are 3 ways to install this plugin and all of them are easy to finish. Why don’t you check this out immediately? And here’s the dedicated installation guide for Automatic Related Product in this link. This tutorial will guide how to create Cross-sell block on the Shopping Cart page that when a customer comes to visit the page, the cross-sell block will entice them to add more related items to their cart and congratulation! More sales! You have to set a new rule to specify when this block is allowed to be displayed, or furthermore, create many Cross-sell block as you want in many product/category pages. 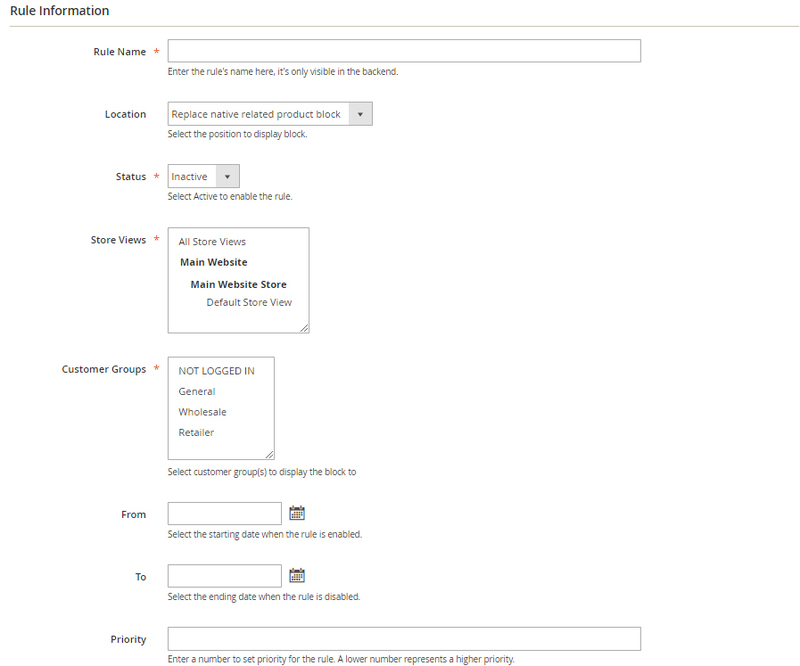 To create a new Rule on Product Page, go to Mageplaza > Automatic Related Products > Manage Rules. In the Add Rule section, select Shopping Cart page. Location is where you specify the block where it located. I’ll choose it as “Replace cross product block” which means replace the default one of Magento 2. I want this rule to be applied on all products so I will leave the Condition tab in blank. In the Limit number of products field: Enter the maximum number of products displayed in a block. 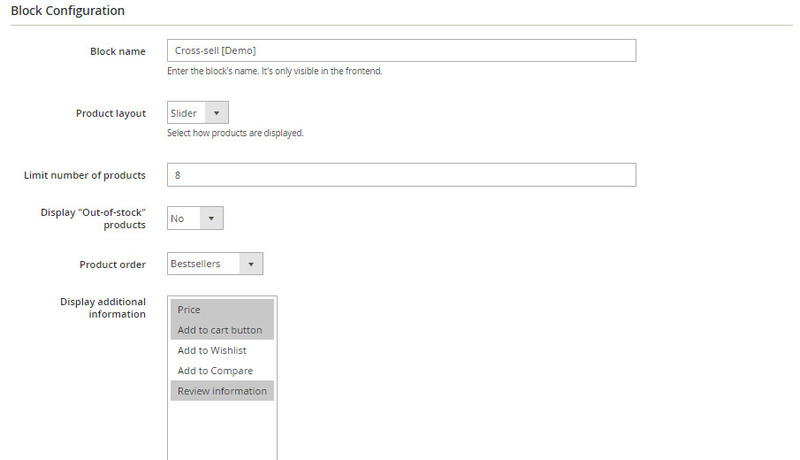 In the *Display “Out-of-stock” products field: select “No” to not display Out-of-Stock products in my Bestseller slider. It’s not a good impression if your customers see unavailable items being featured. In the Product order field: choose how to sort products in the block. I like sorting by Bestsellers. Click Save Config. Now back to the frontend and see the final outcome! Comments for How to create Cross-sell Products block?